Harold Acton. AQUARIUM. Duckworth, London 1923. ‘ Drunk with the whiff of steak in passage-ways…’. (Young Sailor ).Sounds familiar, doesn’t it ? Or how about ‘Mr Bedlam’s Sunday Breakfast’ for the title of a poem? It is hardly surprising that the intoxicating influence of T .S. Eliot on an impressionable freshman like Harold Acton at Oxford in 1922/23 would have been reflected in this, his first book. Indeed, Acton was notorious for declaiming passages from The Waste Land from his window at Christ Church and for being one of the ‘ aesthetes ‘ at the University, along with Betjeman, Waugh and Connolly. Indeed Waugh, who is said to have drawn the best parts of Anthony Blanche in Brideshead Revisited and Ambrose Silk in Put Out More Flags from Acton, claimed he and his friend shared ‘ gusto ..a zest for the variety and absurdity of the life opening to us, a veneration for artists, a scorn for the bogus.’ And this hedonism is certainly present in Aquarium. .
Aquarium has received very little critical attention since it appeared—which may be an example of reverse snobbism by writers on early modernism –the idea that someone with all the privileges that Acton enjoyed ( Italian palazzo, paintings by Italian masters on the walls etc ) could not possibly have written anything worth considering at the age of 19. But the fact remains that despite the verbal showing off of an adolescent flexing his muscles (nacreous, mephitic, fuliginous, nubiferousness are some examples ) many of the poems in Aquarium aren’t half bad. The book shows obvious echoes of Edith Sitwell, whose Bucolic Comedies had appeared in a similar format from the same publisher a year earlier (Acton dedicates a poem to her ). But while Sitwell’s lyrics primarily show her musicality Acton’s poems are strongly visual, even when he is nicking the idea of a poem with a musical theme from the older poet, as in ‘Conversazione of Musical Instruments ‘. Acton seems inevitably drawn to images of a gorgeous opulence , which can be sometimes overpoweringly artificial and stifling. And though he can visualize the naturalistic urban scene, it is always with the disgust of an aesthete surveying the horrors of the Industrial Age. 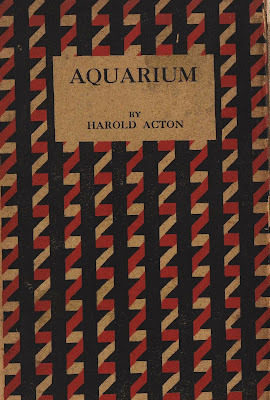 I have an odd and rather disconcerting feeling that i once had a copy of Aquarium and gave it away in a charity box with several other Actons - damn it. Nigel, your blog is one of the most entertaining I know, and is also incredibly useful, many thanks.